So I finally am getting to play Dragon Age! My husband bought it for me for Christmas but unfortunately we didn’t really look at the specs and found it wouldn’t run at all on my old machine. So it sat. So lonely and abandoned. It was sad to see that pretty case sitting on my desk.. just begging to be played. Luckily, it didn’t sit for long, it plays great on my new computer and I’m so glad because it’s such a fun game. It’s been a while since I played a single player RPG type game and it’s kinda nice to not have to mess with other people for a change lol. I love the game so far, it really immerses you into the story and the voice acting is great. If I could complain about one thing it’s that I didn’t feel there were *enough* options in the character creation screen so I ended up with a rather boring looking character. I had hoped for some more options like piercings or more hair colors. But I’m a total girl when it comes to such things and I miss them when they aren’t there. Also, the helms in this game are ugly. I’d love to see a hide helm option so I didn’t have to keep taking them off between fights because I really, really can’t stand to see it on me. I went with rogue mostly because I wanted to play through the Human Noble start quests after seeing them briefly at my sister’s house. I would have preferred mage but you can’t be a noble if you choose mage. Maybe next time I play through I’ll choose an elven mage to change it up. Though really it doesn’t matter as you get to control a full party of different classes so I can play several different class types. If I can figure out why I only get maybe 1 out of every 10 screenshots I take I’ll post more as I progress! My Warden with Alistair. I rather like how she’s looking back at him in this shot. So cute! 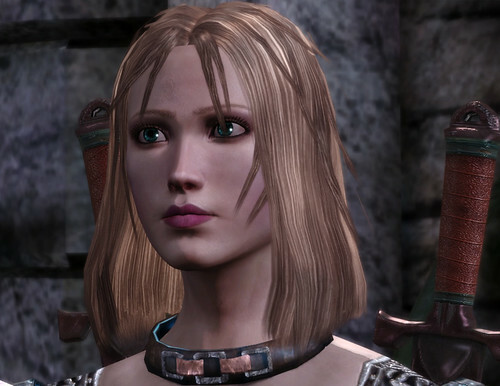 This entry was posted in Dragon Age, frickablogs, Pictures, Project 365 and tagged Dragon Age. Bookmark the permalink. I have to admit, I’m almost scared to finish the game for fear of what will happen! That might be why I keep playing different classes but still haven’t finished the game lol.